In 1942-1943, the 'extermination camp' area was practically devoid of trees or large shrubbery. As a result, the neighbouring farm folk and passers-by could easily observe, through the barbed-wire fence, the prisoners and the guards as well as the various buildings of a camp that is now said to have been ultra-secret. From the perspective of someone facing the entrance to the camp, the Olszuk family farm was located a mile and a quarter to the left, while their plot lay, to the immediate right, 300 meters from the camp's eastern limit. Thus, Marian Olszuk passed close by the 'extermination camp' every day that he went to work at the quarry, and when he worked on the family plot, he was also right near the 'extermination camp. '...Even though, of course, he never entered the camp area, every day people gathered in groups outside the front gate, openly engaging in barter and black market dealing. ....Had Marian Olszuk ever noticed signs of homicidal activities by the Germans in this 'extermination camp?' His answer was No. 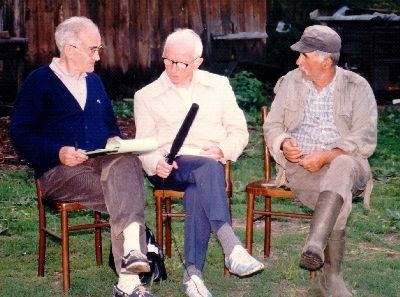 Dr. Robert Faurisson, Tjudar Rudolph, and Mariam Olszuk, in Treblinka, June 1988.